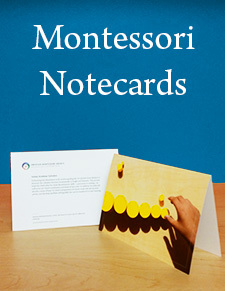 Each set of 10 notecards contains assorted images of beautifully photographed Montessori materials (2 of each): Knobless Cylinders, Button Frame, Sandpaper Letters, Puzzle Map, Spindle Box. Blank inside, with explanatory text (about the material pictured) on the back. Total in each set: 10 notecards, 11 envelopes.